Electronic medicine “could replace drugs…” for certain conditions, says an article in the Scientific American. This was the stunning statement in the lead story of the March 2015 issue of the highly respected magazine. For people who are on chronic medication for sleep, depression, fatigue, arthritis and pain, this is welcome news because taking medications for too long may have unpleasant and even deadly side effects. On the horizon are several innovative “energy medicine” approaches that have the potential for combating fatigue, arthritis and pain, and for improving sleep and energy. What if you could reduce your arthritis pain by sitting in a futuristic energy field? What if your back pain, joint stiffness and other nagging ailments gradually faded away? What if your knees felt good enough that you could go running and dancing again? And what if this energy field enhanced your brain function as well? This is what many people are experiencing with futuristic energy medicine concepts. How does it work? The new concept is not to treat a specific disease, but rather to boost the body’s cellular energy so that the body heals itself. Does this sound like fantasy? In reality, this was presented at a United Nations round table and some experts think that this may be the future of medicine. This “energy medicine” system is a combination of health-supporting modalities that are centered on the use of an energy field chamber. Users sit in the chamber, taking a nap or meditating in this energy field. 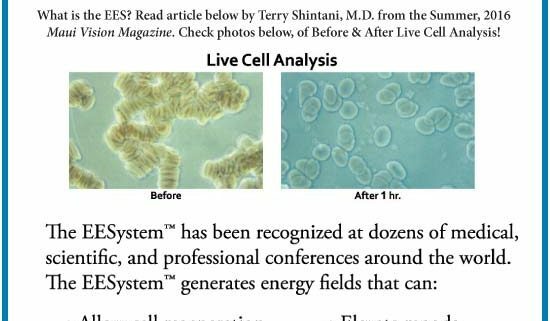 According to Dr. John Orava, physicist and consultant to the Department of Defense, the field affects every cell in the body. Terry Shintani, MD, JD, MPH, KCSJ is a professor of medicine, lecturer, radio talk show host, and community advocate. He is author of 12 books on health, and holds several important positions in the field of integrative medicine. For information or to schedule a session: 808.276.6864, www.eesystem.com; on Maui: www.ayinadams.com, holisticallyalive@ayinadams.com.